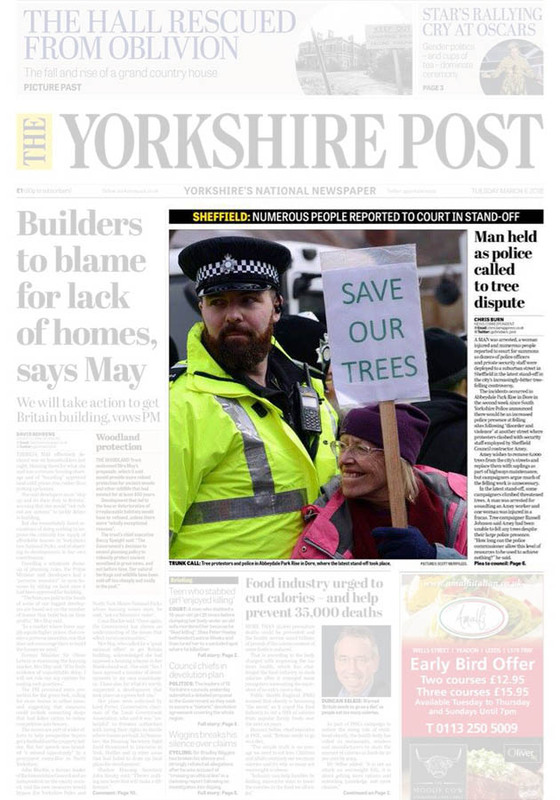 13th December 2018: Yorkshire Post – Sheffield Council to fell fewer street trees in bid to resolve bitter dispute. 27th June 2018: The Guardian – ‘There is no oak left’: are Britain’s trees disappearing? 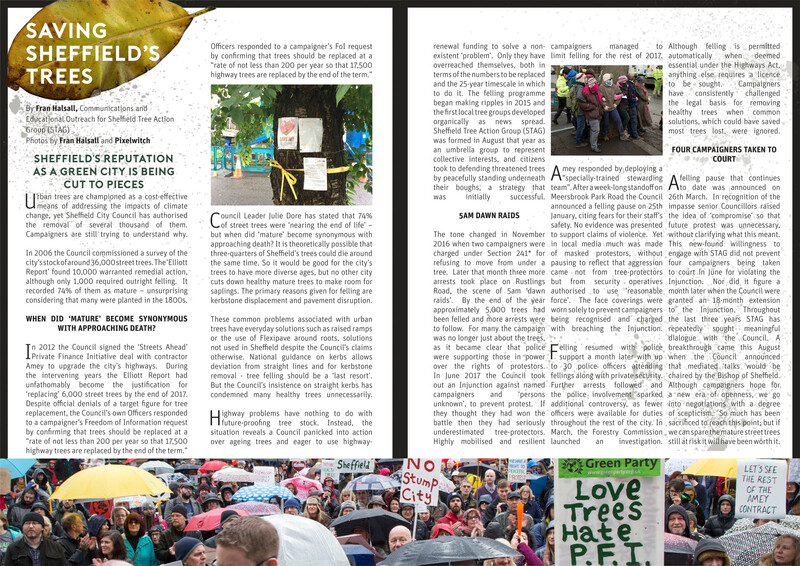 Summer 2018 – The Arb Magazine – Sheffield’s street tree management Streets ahead or years behind? 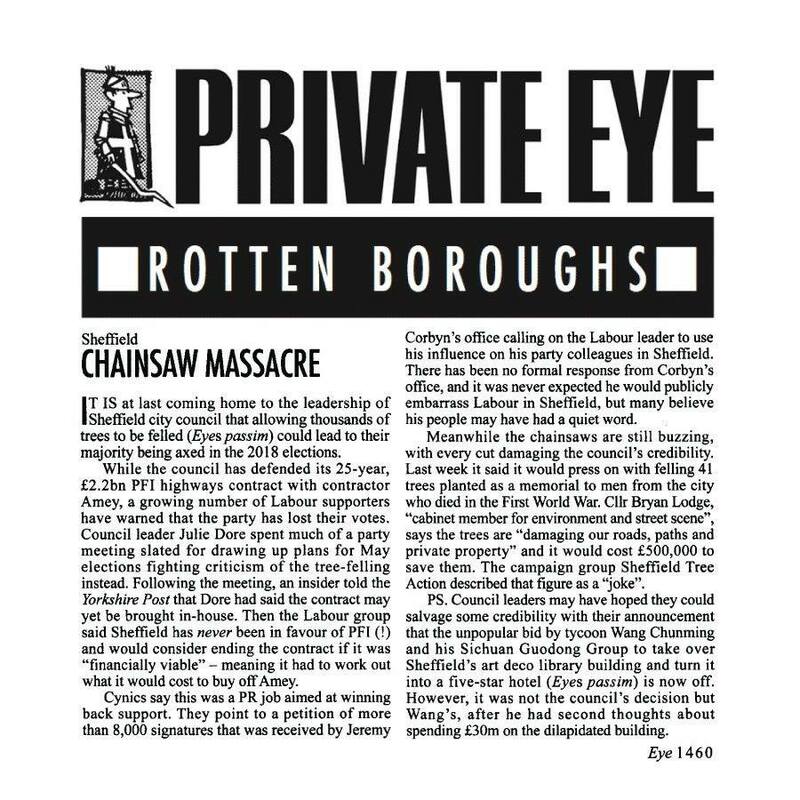 2nd May 2018: I News – Local elections 2018: Could anger over tree felling chop Labour’s majority in Sheffield? 6th March 2018: Medium – Nicola needed to get to hospital. Tree felling barriers blocked the way. 12th February 2018: Future Arch – Streets Ahead? 17th January 2018: The Planner – Streets ahead, or one step behind in Sheffield? 10th November 2017: Huffington Post – Sheffield Council: Deceptive or Stunningly Incompetent? 24th October 2017: Jonathon Porrit – Why Sheffield’s Trees Matter – to All of Us! 18th October 2017: Twitter – Trees for Cities offer to pay for the solution to retain Vernon Oak. 18th August 2017: The Woodland Trust – Trees and the steel city, what’s gone wrong? 12th August 2017: The Guardian – The council pays me to protect trees from destruction – but for how long? 10th August 2017: Yorkshire Post – Stopping Sheffield tree-felling ‘would be morally reprehensible’, claims council and Sheffield City Council’s response to Michael Gove. 21st November 2016: The Guardian – A dawn raid, dissenters silenced: is this a war on trees? 12th September 2016: Sheffield Star – Letters – Worthy of trust? 6th March 2016: Daily Mail – The chainsaw massacre!